Those who ignored the warnings of the emergency services yesterday are "reckless idiots", the sister of heroic Coast Guard Rescue 116 Captain Dara Fitzpatrick has said. Despite the Status Red warning that was issued nationwide as Ophelia battered Ireland, some people still did activities like wind surfing, swimming and sailing. 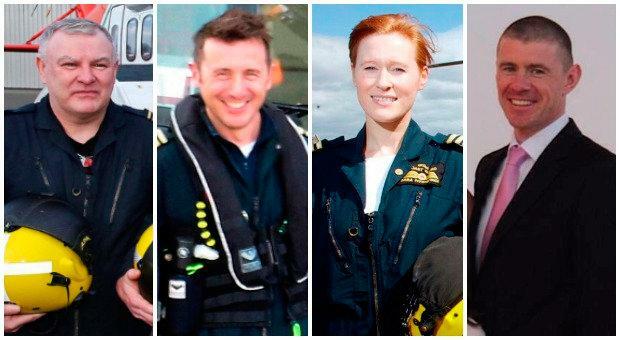 The crew of Rescue 116 - Dara Fitzpatrick, Mark Duffy, Ciaran Smith and Paul Orsmby - all lost their lives when their helicopter crashed off the coast of Co Mayo in March. Dara's sister Niamh has criticised those who put themselves at risk yesterday. She Tweeted: "Regarding those reckless idiots, now I think even if it was their mother/sister/brother/father in rescue crews it might not stop them. Disgusted." She also backed calls for anyone who put the lives of emergency service workers in danger by doing reckless activities to be charged with endangerment. Niamh also said that she was dismayed to see reports of people having to be rescued by Coast Guard crews after they ventured into the water. She said: "Please heed these warnings & do not put the lives of emergency services personnel at risk unnecessarily. Stay in for just one day. "I never do rants on twitter but that coast guard tweet has my blood boiling. PLEASE cop on people. Stay IN. "Let that be the last needless callout during Ophelia. Would you go out if YOUR loved one was emergency services personnel? Think about it."